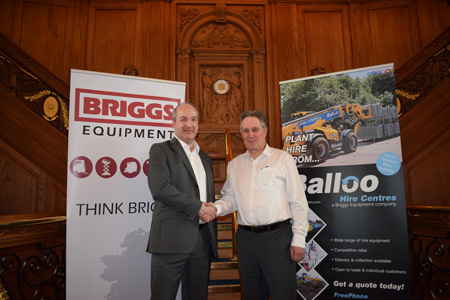 Briggs Equipment has completed the acquisition of Balloo Hire Centre Ltd, one of Northern Ireland’s largest tool and plant hire businesses, a move that represents the latest milestone in a programme of growth that seeks to build on the core strengths of the asset management and engineering services specialist. Balloo provides Northern Ireland’s business and domestic markets with plant and tool hire. Balloo’s fleet totals almost 10,000 units across a product range of more than 650 items, which makes it one of the largest and most versatile ranges in the industry. Balloo has over 120 employees and operates from five locations in Northern Ireland including their head office in Belfast, Bangor, Lisburn, Ballyclare and Glenavy. This acquisition will strengthen Briggs’ hire capability in Northern Ireland and complement the existing activities. Balloo has extensive experience with the region’s thriving film and television production industry and has supported very well-known productions including Game of Thrones. The culture and values of Balloo are already firmly aligned with those of Briggs, with their focus on safety, provision of quality equipment and commitment to delivering a first class service to build lasting relationships with customers. Dan McCaffrey, Managing Director of Balloo Hire Centre Ltd said, “I’m delighted to see the Balloo name becoming part of another equipment supply success story. Our two companies are a great fit for each other and this can only mean good things for our employees and customers as we look to continue a period of strong performance”. The acquisition sees Balloo become a wholly owned subsidiary of Briggs, continuing to trade under its own name and with all current operational contacts remaining in place. For more information on Briggs Equipment visit www.briggsequipment.co.uk.